You play the electric guitar? You are worry about the latency in your cable? You feel handcuffed by the ugly cable? Just replace the cable to a wireless link made by Systec Designs. 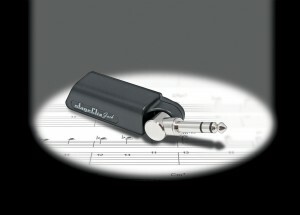 The Dutch developer Systec Designs claims its ‘stageClix’ wireless guitar jack – which employs Nordic RF technology – is the lowest latency digital wireless audio adapter of its kind available in the world and is actually superior in many ways to a traditional hard-wired guitar-to-amplifier cable link. The use of ultra low power Nordic transceivers enables the unpowered transmitter jack that plugs into a guitar to deliver up to 15 hours continuous use when powered from a pair of built-in rechargeable AAA batteries. In operation, the stageClix offers ‘plug & play’ simplicity and employs a patent-pending anti-interference protocol technique Systec calls ‘triple-diversity’. This streams audio over three ‘frequency hopped’ channels that are widely spaced across a total of 80 available Nordic channels. Using a technique similar to RAID-style redundancy from the high-end PC server industry, ‘reconstruction’ of lost data packets from any two of the three hopped frequency channels is possible. Alongside this ‘RAID-redundancy-principle’ a second algorithm is used to take care of ‘intelligent interpolation’ in case full reconstruction of data packets by the primary ‘RAID-algorithm’ fails for whatever reason. Could you give me more info about it or the wireless audio application you have? For the case, how about the RF channel bandwidth, and the audio is digital stream? If so, how about the sampling rate of the audio — 48KHz or 96KHz or higher? * 2Mbps/1Mbps/250kbps programmable on air data rate. Calculate yourself. I do not know if they use the ARM0 with its 10 Bit ADC or if there is an external ADC in use. You have to feed the transceiver with binary data and if the sampling rate of the embedded ADC is to slow, then you have an external ADC. The German magazine mentions a delay of 3 mS and no drop-outs on the radio link.